Thanks to a good idea from a caring Auburn student, Operation: Passion has started what hopes to be a successful fundraiser for victims of the Virginia Tech shootings. The university community was stunned Monday morning when a gunman killed more than 30 people, including students, at Virginia Tech University in Blacksburg, Va.
Students will gather tonight in remembrance of the school shooting that shocked the nation on Monday. As the campus of the Virginia Polytechnic Institute awoke to a changed world this morning, new developments emerged about the alleged gunman whose shooting spree claimed 33 lives, including his own. A man called in a bomb threat to Othmer Hall around noon Friday, university officials said. Last week was one of tragedy as schools and universities across the United States faced the terror of threats of bombs and shootings on their campuses. Guns kill people. People kill people. Guns help people kill people. 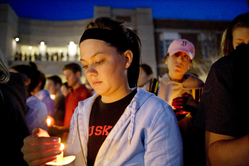 Events such as the Virginia Tech shooting can be hard on some students. Besides psychological services, students seeking counseling can also find help at campus ministries. The recent shootings at Virginia Tech have caused many to worry about a backlash against South Korean students. Bomb threats, drunken drivers, pot smokers and thieves. Those are just of the few problems university police dealt with during the past year. With the looming arrival of the fall semester at the University of Nebraska-Lincoln, University Police are preparing for the increased number of on-campus students.